Knowing bedroom temperature is generally not a priority for most adults. However, with a child sleeping in the room, parents would need to know the temperature to make sure they have dressed their child properly. Knowing the temperature outside the room is another interesting need. In autumn, when a person feels that it’s a bit too hot inside a room, one of the common reaction is to open the door or window, assuming it’s cooler outside. In reality, that’s not always the case and opening door or window might backfire by raising the temperature inside the room. Before getting this product, I already have 2 clocks with thermometer in my house. Sadly, those clock-thermometers show different reading even when I put them side by side. So one of them is off (or both), but I have no idea to find out which one. This time, I decide to get one of the trusted brand for my thermometer. After a bit of research, my choice went to this Oregon Scientific EMR201. 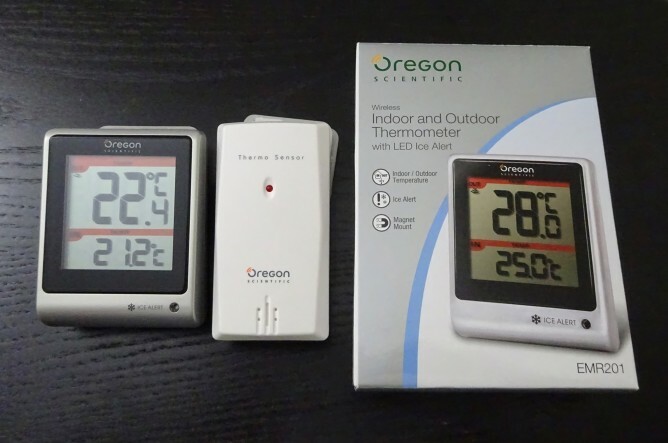 This product has 2 pieces of hardware: the indoor unit with display and the THN132N outdoor sensor. Indoor unit has 66 x 27.5 x 87.5mm dimensions, weighs 241 gr without battery, can measure -5°C to 50°C and powered by 2 x AAA batteries. It can be used on desk (it has built-in desk stand), it can be mounted on the wall, or its strong magnets at the back allows it to be attached to our fridge. The outdoor sensor has 96 x 50 x 22mm dimensions, weighs 62 gr, can measure -20°C to 60°C and powered by 1 x AA battery. Both units are communicating through 433MHz wireless signal. I love the fact that there was no pairing method needed. Both units work straight off the box as soon as I put batteries inside. I choose this model because it does what I need and nothing more. I need to know the temperature inside the bedroom, and the temperature outside. I don’t need fancy weather prediction (I have my smartphone for that) and I don’t even need additional clock inside the room. So this model is an ideal choice, especially that it’s considerably cheaper than Oregon Scientific’s most other models. Being a well-known brand in temperature and humidity sensor apparently does not guarantee the accuracy of their products. Repeating the same experiment that I did with my two clock-thermometers, I put the indoor unit and outdoor sensor side by side, hoping they would detect same temperature reading. They don’t. I still get two different readings (see the photo above). So, right now I have yet two more thermometers, and I still don’t know which one I can actually trust.